If there are two things Ben Heckendorn loves, it's crafting immaculate homemade gaming machines and prolific actor Bill Paxton. Thankfully, Mr. Heckendorn's latest project lets him explore both. 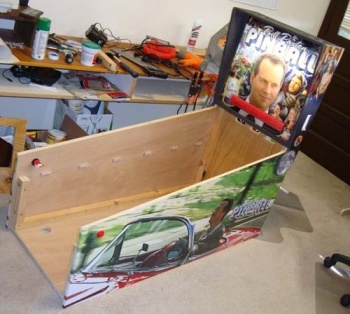 Appropriately dubbed Bill Paxton Pinball, Ben Heck's latest project marries the many, many, many film and television roles the actor has appeared in over the years with a full-sized pinball cabinet. Sadly, the cabinet is being constructed as a one-off personal project. As Heckendorn explains, the use of numerous copyrighted sound clips from Paxton's various films would make selling the machine a legal nightmare. Why Bill Paxton? Well it's as good a theme as any - I guess I could have gone with a more obvious geek choice like Bruce Campbell but to be honest, Paxton's more interesting and has made movies people have actually seen. In the end what this project is really about is building something very complicated from scratch, so the engineering is the real star. No Mr. Heckendorn. I believe Bill Paxton is the real star.